Still completely free and no credit card required. You get stunning charts, all US stocks & options, dozens of indicators, delayed streaming data, option chains, even free practice trading. 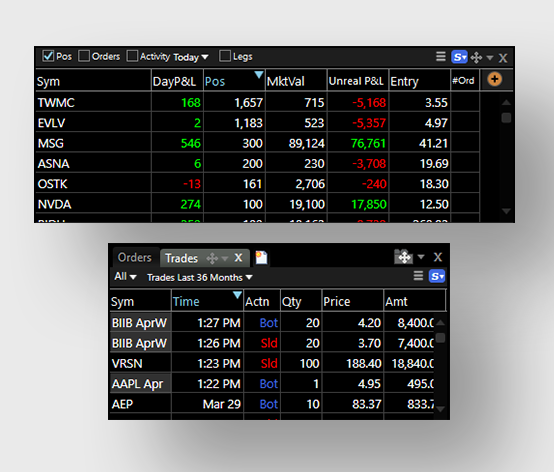 All inside the award-winning TC2000 software for FREE. When you start TC2000, choose Run in Free Mode for access to all of the features below. Upgraded data feeds & features are available but not required. 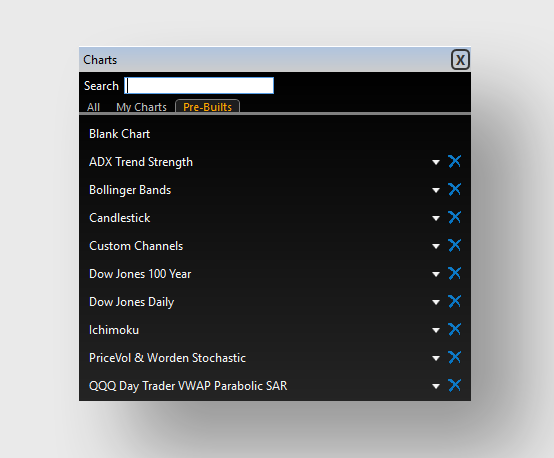 Looking for the old version of FreeStockCharts? Plot option charts with the underlying stock to see the relationship between the two. 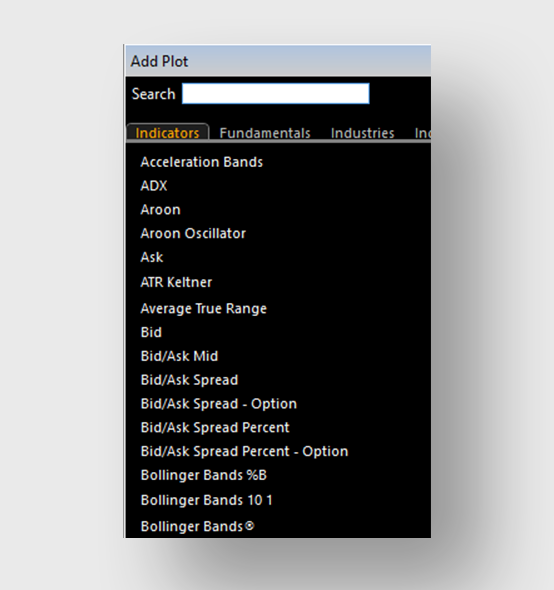 Now you can plot bid/ask data or last-trade data. 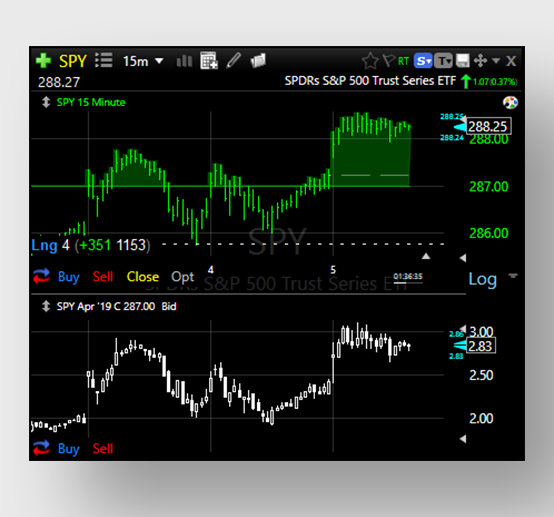 This makes beautiful, streaming charts for even the most thinly traded options. Notice the shading in the stock price that shows when the option is in the money. Track your positions, pending orders and trades. 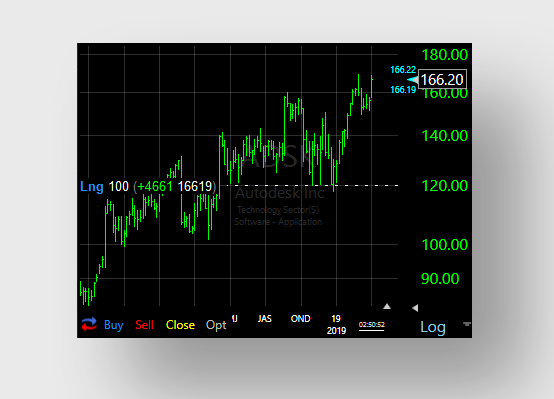 This a fully functional trading simulator that gives you access to all stock & option strategies. You can practice limit orders, bracket orders with profit targets & stops, OCA's, multi-leg orders and more. This is the same trading platform used with TC2000 Brokerage, but in a free simulated mode so you can hone your skills with paper money. 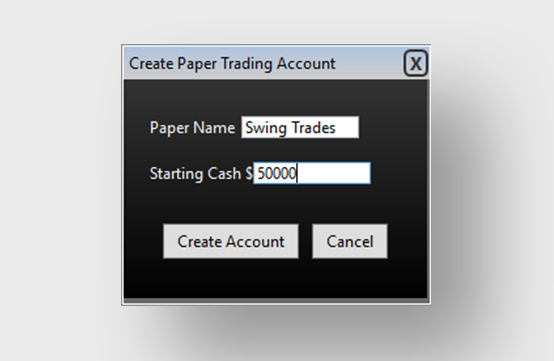 Create unlimited paper accounts to test your ideas and strategies. There's no better way to learn without risking a penny of real money. 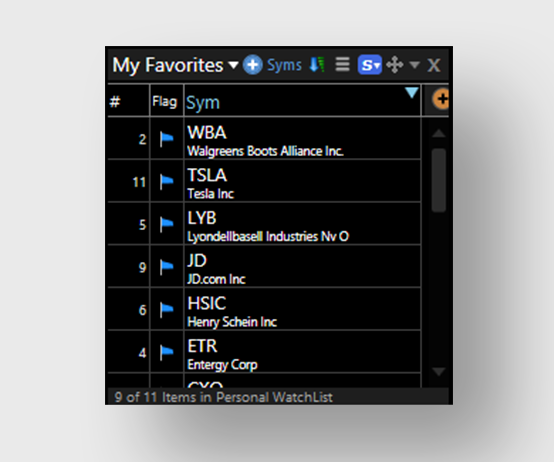 Drag-and-drop symbols to your Favorites Watchlist. Manually rearrange to keep your most important items at the top. Have a plan, stay organized and follow it. 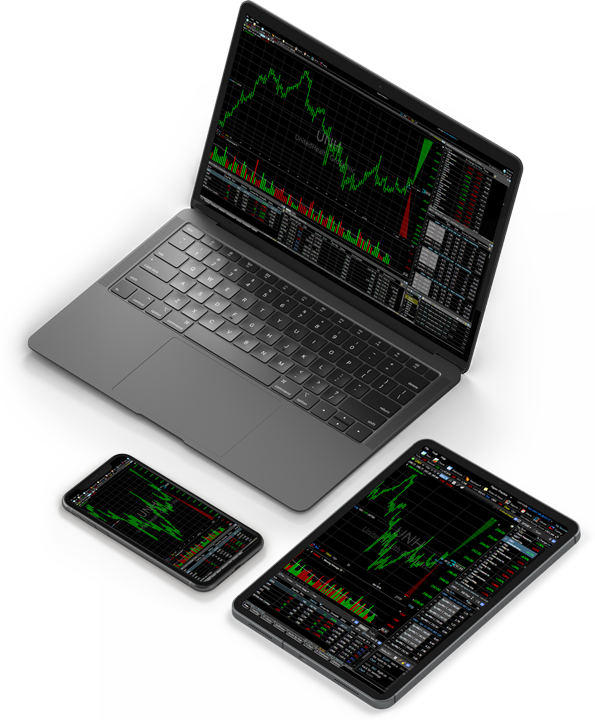 Access dozens of market index watchlists including the SP-500, Nasdaq 100, High Cap 1000, NYSE, Biotechs, Gold & Silver, Airlines, Oil, Financials, TSX and more. Please note that Dow Jones, sector indexes and some other indexes may require an additional subscription. When something catches your attention or you want to remember something specific about a stock, write a note to make sure it doesn't fall through the cracks. Journaling is a great way to improve your own personal trading habits. 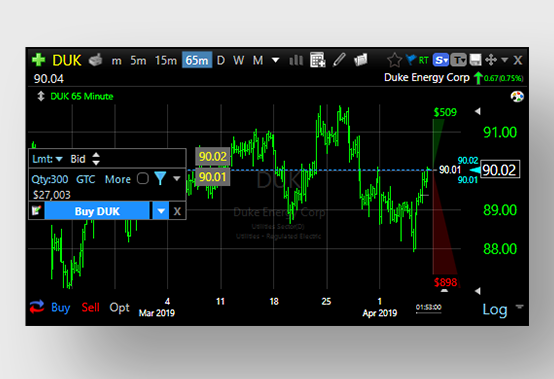 Charts are automatically saved with your notes for quick reference when reading in the future. 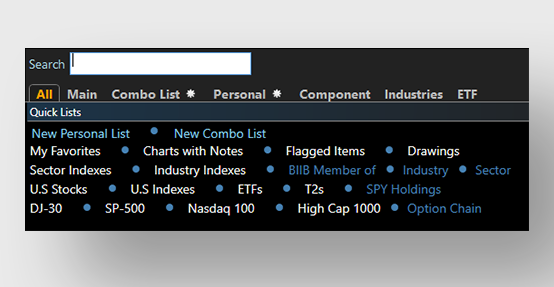 This patent-pending tool makes it easy to visually understand option strategies. The P&L zones on the right side show profit, loss and breakeven levels for the stock at expiration. In this example, you want the stock to go side-ways. The green zone represents a profit of up to $1000. The breakeven levels are $297.18 and $273.75. The red zones show unlimited loss to the up and downside. 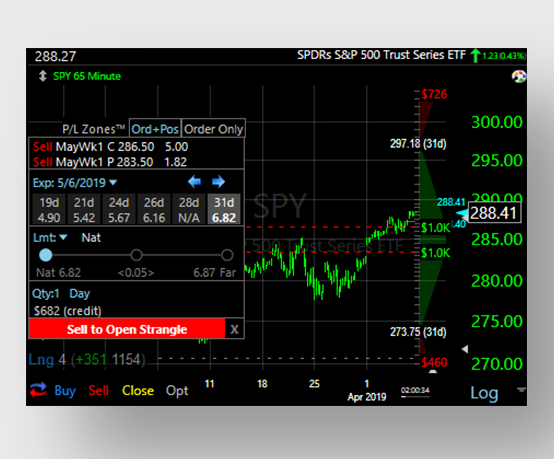 As you slide the strike price lines on the chart and move through expiration dates, the P&L zones are updated dynamically making it easy to see the impact on risk/reward. 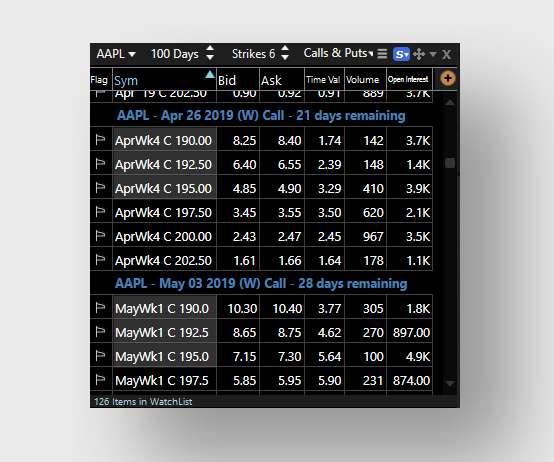 Access over 100,000 option contracts for FREE. 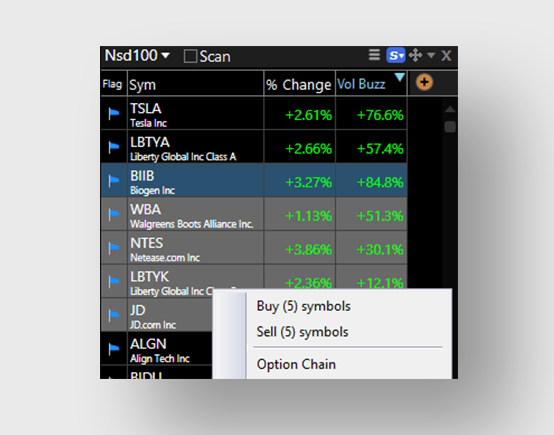 Narrow down chains by calls, puts, number of strikes and time to expiration. Multi-select symbols to batch them all into the same simulated order ticket. Then set their limit prices relative to the market. You could place an order to buy all five. Or you could use an OCA group to only get one of the five. For example, maybe you set high breakout prices and only want to buy the first stock to breakout. OCA stands for one-cancels-all. 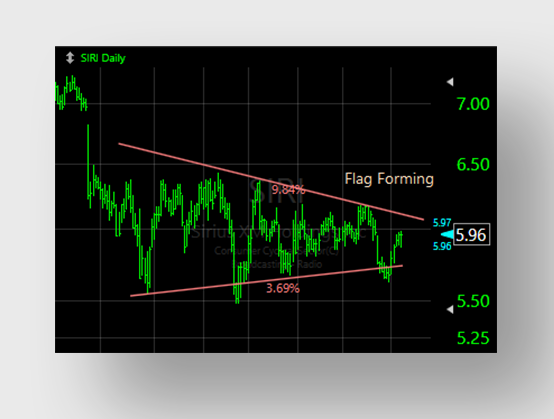 Draw trendlines to help you identify trends and patterns. 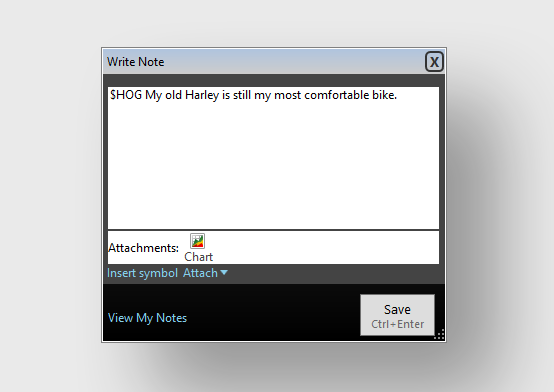 Measure swing sizes and write notes directly on the chart that are automatically saved for the next time you return. Drag limit & stop orders to visually place simulated orders at specific prices. Customize and save charts to your own library. 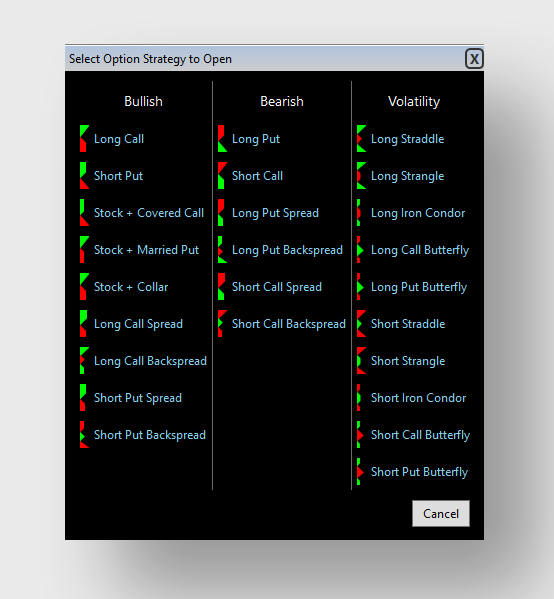 Simulated long, short and option positions are displayed on the chart for a quick reference of gains and losses. Plot from a large library of indicators. You can even plot indicators of indicators. Some indicators may require a higher level of service.